Introduced with great fanfare in 2002, the Jeanneau Sun Odyssey 54 DS was the company’s flagship model, and we can see why. An elegant performance cruiser, blending both French and Italian design cues, one could go in number of directions when buying new bedding for this well-appointed stateroom. 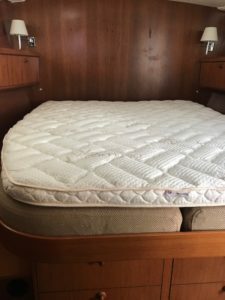 Our client felt the that original upholstered two-piece mattress in the forward, while still in good shape, could be more comfortable. A 2” Latex topper, with luxuriously soft bamboo quilting, did just the trick; and covered the gap between the original two piece mattress. 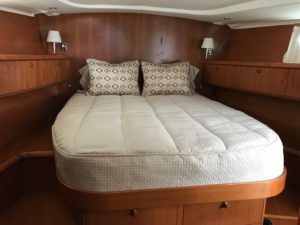 A waterproof mattress pad cover and 600 thread count Egyptian cotton sheets provide the luxury and comfort that one expects while overnighting on a Jeanneau. For bedspread, blanket and shams our customer chose our Teak Bedding Package; one our 30 different Best Selling Bedding Packages. 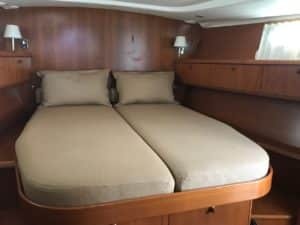 Are you ready for the most amazing sleep you’ve ever had on your boat? The custom boat bedding you’ve dreamed of is just a few clicks or a phone call away. Let’s make your stateroom a STATEMENT ROOM!